Sailor Moon: Sailor STARS Fandub - SPF Studios - High quality fandubs for all ages! Sailor Stars begins with six episodes that re-introduce the previous season's villain, Queen Nehelenia, as well as the four Outer Scouts, who meet her for the first time (they did not appear during the fourth season). These episodes originated as filler to allow Naoko Takeuchi (creator of the Sailor Moon Series) time to begin her new story-arc; afterward the season follows the manga. 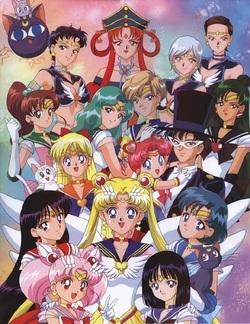 Its plot branches out to introduce new characters and even new Sailor Scouts from other planets, including the Sailor Starlights, Princess Fireball, and Chibi Chibi. As in the manga, Rini returns to her own time after the final battle with Nehelenia, and is not a participant in the events of this story arc. The primary villain is Sailor Galaxia, queen of the Negaverse, who seeks to rule the galaxy by collecting "true star seeds" (the equivalent of the manga's Sailor Crystals). Of the five story arcs, Sailor Stars is the only one featuring recurring villains of only one gender; all female, because they are all parody-scouts-- or commonly known as the NegaScouts. Taiki Light/Sailor Star Maker - ??? Sailor Aluminium Siren - ??? Sailor Lead Crow - ??? 169: A Moment to Reflect: Part 1 and Part 2 *Full episode from Veoh later this week.